The F-35 Lightning II is one of the most complicated, controversial, and expensive defense projects in history. But it may finally be turning a corner. Like a container ship that takes miles to change direction, the F-35 program is gradually improving, and closing in on a final round of tests to determine the plane’s viability. Although the fighter still has a ways to go before being truly ready for battle, the F-35 is no longer in any serious danger of being canceled—if it ever truly was. All in all, 3,100 aircraft will be built over a span of several decades, including over 2,400 for the U.S. armed services, making it the most numerous and widely fielded fighter since the F-16. The F-35 will fly until 2070, or the better part of a century, making it one of the longest-lived fighters ever flown. The cost of buying the planes and supporting them until the late 21st century is estimated at $1.5 trillion. U.S. Marine Corps F-35B during takeoff and landing operations. The F-35 includes several key technologies that make it a so-called “fifth-generation fighter.” One is the ability to avoid detection on radar, commonly known as “stealth.” (No, despite what the President thinks, it is not literally invisible.) Another is the networking and information sharing system that allows pilots in the air to pass data with one another, other allied forces, and work collaboratively to kill the enemy. Yet another is the fusion of sensors—including radar, electro-optical targeting systems, and a network of infrared cameras pointing in all directions—that is presented to the pilot via a $400,000 custom-fit super-helmet. One of the biggest problems with the F-35 has been acquisition cost. The first F-35As cost a staggering $279 million per jet, a function of the newness of the aircraft and the tiny number that were purchased. That number was far, far above the original claim in 2001 that the jet would cost $50 million a copy. It was also completely unsustainable. Lockheed Martin and the Air Force, through production streamlining, cost saving measures, and bulk pricing have steadily whittling the price down. Lot 10, the latest negotiated price for the F-35, has the A model at $94.6 million, the the Marines’ B model at $122.8 million, and the Navy’s C model at $121.8 million. A F-35C landing on the aircraft carrier USS Abraham Lincoln, August 2018. The good news is that the cost of the jet is still coming down. Vice Admiral Matt Winter, director of the F-35 program, believes that all three aircraft will fall under $100 million with Lot 14s and 15 somewhere around 2020-2021. The A model should come down to $80 million by 2020. That’s actually pretty close to the original $50 million price tag, adjusted for inflation. A bigger, long term problem for the F-35 is operation costs. An F-35 airframe has a lifespan of 8,000 hours, and currently the F-35A costs $50,000 an hour to fly. That doesn’t just include fuel, but also things like maintenance for the special radar-absorbing coatings. That’s more than twice as much as the cost per hour for the F-16. At that rate, to fly a single F-35A would cost a staggering $400,000,000 over the lifetime of the aircraft. Granted, that’s over decades of flying, but that’s still an awful lot of money. The armed services—and the F-35’s foreign customers—desperately need the cost per hour number to come down. If it doesn’t come down, the F-35 could saddle governments with high recurring costs for decades, draining defense budgets. In March 2018, an internal Air Force analysis concluded the service might have to cancel orders of 590 of the jets just to afford flying the rest. A U.S. Air Force F-35A performs a high speed pass over Lake Michigan, August 2018. Another problem stems from a concept known as concurrency. Everyone knew the F-35 program would take years to mature, and that waiting for all of the kinks to be ironed out could delay production. An agreement was made to begin purchasing aircraft when the design was pretty much finalized, in order to get the production line going, discover efficiencies, and get pilots training on an early version of the jet ASAP. Once the aircraft was fully ready for production, older jets would return to the factory and brought up to the final standard. That’s what was supposed to happen. The problem with concurrency is that it is incredibly complicated, and tacks on additional expenses. While the F-35 did get all the benefits of concurrency, especially the pilot training aspect, there are hundreds of F-35s spread across the planet that will eventually need hardware and software fixes to bring them to the final standard—which hasn’t even been decided yet. These upgrades will have to be identified and paid for each aircraft, adding to the plane’s cost. Concurrency has led to another problem: older F-35s have far lower readiness rates than newer jets. Planes from Lots 2 through 4 are available only 40 to 50 percent of the time, while newer jets are available 70 to 75 percent of the time. It makes one wonder: if older jets were so expensive and are now so unreliable, was the whole concurrency scheme worthwhile to begin with? A F-35 conducts a test flight with four GBU-31 2,000 pound guided bombs and two AIM-9X Sidewinder missiles. The F-35 can carry weapons and fuel externally at the cost of its stealthy profile. Everyone’s favorite controversial jet has also, in time, become the necessary jet. 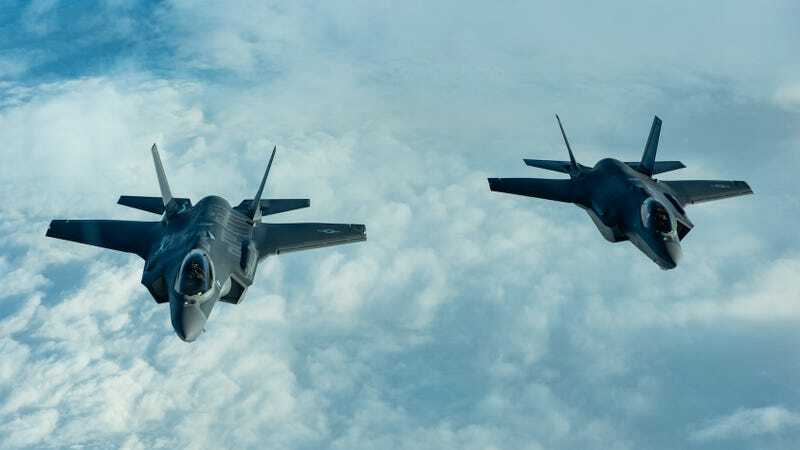 Critics have also charged that given all the problems with the jet, the F-35 could be replaced by older aircraft updated with modern electronics and weapons. They contend that buying upgraded versions of the F-15, F/A-18, and F-16 would be cheaper both in acquisition and operations costs. The planes wouldn’t have the F-35’s stealthy features, but hey, we’re hunting for bargains here. Time has caught up with this assertion. As we’ve already covered, the price of the F-35 is coming down, making it competitive with modernized older designs. Meanwhile, the world isn’t standing still: potential adversaries have both begun production of their own fifth-generation fighters. Russia is developing the Sukhoi Su-57 while China is working on the Chengdu J-20 and the Shenyang J-31. On the ground, Russia’s S-500 long range surface to air missile system has entered production. Older, non-stealthy jets are vulnerable not only to these weapons but also older ones, a fact illustrated by the Israeli Air Force’s loss of a F-16 in winter 2018 to a Cold War-era SA-5 missile. The threat environment has become more complex than ever over the last ten years, and F-35’s combination of features will keep pilots alive longer over an increasingly lethal battlefield. Yet another problem: the F-35 is several years late, and that’s created serious problems for the flying services. The A model for the Air Force was supposed to be what’s known as “initial operations capable,” a state when at least one squadron can conduct limited combat operations, in mid-2013. It didn’t happen until August 2016. The B model was supposed to reach IOC in 2012, something that didn’t happen until 2015. The Navy’s C model was due in late 2015, but the service is now aiming for early 2019. A USAF F-35 launching a AMRAAM air-to-air missile. The F-35’s tardiness created readiness in the aircraft fleets of the Navy and Marine Corps. The Navy in particular was forced to fly older fighters longer, planes that were difficult to source parts and which required more time in maintenance. This created a cascading effect which in turn put pressure on newer Super Hornets, stressing the entire strike fighter fleet. The Marines, who took a long break from buying fighters to wait on the F-35B, have also been forced to rely on older planes for longer. As a consequence, reliability rates for the service’s Hornet fighters got much worse, and the Corps ended up buying the UK’s entire fleet of retired Harrier jump jets to keep Marine Harriers flying. One unabashedly good thing with the F-35 is that it has never crashed and it has never killed a pilot, yet. That’s all the more amazing considering that the F-35 already has more than 100,000 flight hours. It has caught fire three times, and a 2016 fire injured an Air Force pilot. That works out to about three major incidents per 100,000 hours, an unusually safe record considering the newness of the aircraft. According to the General Accounting Office, all three versions of the F-35 must accrue a total 200,000 hours in the air to be considered a mature design. The very first F-14 Tomcat, on the other hand, crashed on its second flight. Six pilots were killed and 31 Tomcats were lost to a single problem before it was fixed—the tendency of the F-14 to go into an uncontrollable spin. The star of Top Gun went on to have a career average of 8.87 major incidents per 100,000 hours. Older Cold War aircraft did even worse, with the F-100 Super Sabre fighter racking 21.2 accidents per 100,000 hours and the Lockheed F-104 Starfighter in German Luftwaffe service having an astounding 139 major incidents per 100,000 hours. The F-35 Joint Program Office, the Pentagon group that oversees the entire F-35 program, is under pressure to declare the jet ready for full-rate production in October 2019. Declaring the jet ready is a good thing because it means orders will quickly ramp up and prices will fall. Preceding this, however is the Initial Operation Test & Evaluation round of tests that will determine if the F-35 is ready for prime time. A total of 23 fighters will undergo a battery of tests in late 2018 or early 2019, and if they fail it could throw a lot of issues into doubt—including full rate production and the Air Force and Marines’ declarations that many of their F-35s are combat-ready. The F-35 Joint Strike Fighter is, like it or not, here to stay. Even if the United States and its partners ditched the aircraft for something “just as good,” that aircraft does not exist. The fighter is not just too big to fail, it’s too important to fail. There is no other Western aircraft in production that gets its owners to 2070—and not even the F-35 may do that, if relations with Russia and China worsen. The F-35 certainly has its problems, and in many ways we’re only scratching the surface. But the days of the F-35 on deathwatch are, barring some fresh new hell, over. The F-35 has been a textbook example of how not to run a defense program but, having gotten that off our chests, we are left with an airplane that is admittedly making progress. The F-35 program will stagger on and eventually produce a cost-effective, capable aircraft. There’s frankly no other choice.